Lies, Damn Lies, and Startup PR: What's In A Picture? I'm going to split this into three sections - my reaction, the tech, and the business implications so people can skip bits that aren't of interest. What we have here, I'm going to assume, is a uBeam transmitter (large box with hexagonal tiles up top) and attached to the phone a receiver (the black brick in the bottom right). What was my first thought in seeing this? (After finishing laughing that is) Clearly they aren't any better at handling publicity than they've been over the last couple of years, with the PR firm clearly so asleep at the wheel they don't even know they're being ridiculed. Given they can actually manage to turn a positive article from a journalist into another piece pointing out the ridiculousness of typical day to day life in the company, it's no surprise that this quality a job was done here. This, I believe, is the first official public unveiling of a setup that's been promised almost every year since 2011 or so, from a company that's raised $25 million. Is there simply no realization of how bad this looks, or is there an absolute lack of shame or care? Your big reveal should amaze and wow, it should scream that you are delivering, at the cutting edge, that you know how to get the details right from the finest detail to the grandest strategy. What this says is "Hey Granny, do you think I'll win the school fair with this?" not "Thanks investors for the $25 million, we're about to change the world!" How unprofessional does this look? First thing is that they don't seem to be interested in tidying up the lab and staging before taking a picture to send out publicly, with bags of paper, white board, old carpet, and generally an unimpressive setup visible. It's like leaving your dirty underwear on the floor when your partner's parents come round for the first time. It makes me wonder if, like President Trump impulsively sending out Tweets in the early hours while no-one is minding the store, uBeam staff came to work in the morning to see the FB feed and said "we posted what?". If any of that team have been laughing about 'covfefe' then perhaps it's out of sympathy for the Whitehouse staff and what they have to go through every day. I read the goings on with President Trump and his staff and every day I see yet another corollary to working at uBeam - just in that case it's actually about something important. Allow me to give uBeam some suggestions as to what to do next time. Begin with "decide the image you want to present to the world". Is it "sleek consumer design that Jony Ive would be proud of" or "cutting edge sci-fi level tech", for example, then setup the situation to reflect that aesthetic. For the former, put it in a sleek case that you've built with impeccable industrial design, you know, kinda like the one that was shown at the Upfront Summit last year? Any reason you couldn't use that? 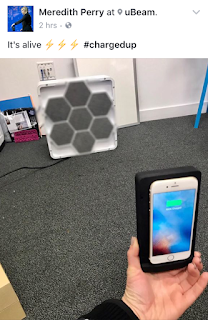 Put it in a user setting with happy people pretending to charge their phones, at the office or at the coffee shop. For the sci-fi side, get it in the lab with oscilloscopes and other equipment arranged in an impractical manner that would never actually be used that way but looks really cool to the average Joe. Hey you could even take that last setup to the next step and even show the voltage and current at transmitter and receiver! Whatever you do, decide on a marketing theme that can sell and take the time to do it justice. Along with the pics, actually put out a press release that says something. Take a look at Energous, they're perpetually 18 months from product after a few years and yet they put out professional press releases. You've a model to work from - take a look! And one final suggestion - and it's not like anyone would have ever told you this before - when you're doing wireless power, don't show any wires in pictures of things being powered! Seriously - I've not worked there since 2015 and I'm embarrassed by this. Now some time was taken to do a little blurring on the pic - you can see over the box that photoshop had a blurring filter applied in a circle over it. Perhaps this is to obscure that it's likely off-the-shelf components from Murata as I noted in a previous blog entry. (It could be an image overlaid to truly obscure and mislead, but I don't think so). That's a bit strange, as I have pointed out in other posts that there's no issue in putting a mesh over the front to obscure what's behind, those Murata devices have it done to them by default. That mesh would also obscure the screws in the plastic and make it look at least a little more professional. Blurring aside, the transmitter is now in a hexagonal arrangement, unlike the regular grid seen at the Upfront Summit, with 7 hex panels each around 15 elements across, so 45 or so elements top to bottom. If it is the Murata 40S4S then that's 45 cm top to bottom, and around 1600 or so elements total. At $3 each, there's $5000 of transmitter parts right there, and those are parts that sell in enormous volumes to car manufacturers so there's not a lot of room to lower the prices further. That implies a $15,000 transmitter, minimum (typical 3x markup from COGS to sale price). The box is maybe 3 to 4" deep, and it's positioned so you can't tell if there's a ton of electronics or power supplies sitting behind it - there were a lot of electronics in a large box in the Upfront demo, perhaps they've been downsized and rotated to fit in the box. Regardless, it's a pretty ugly box and nothing like the prototype that we were given a 'sneak peek' of at the 2016 Upfront Summit - what could have happened? The hex pattern is interesting, and I wonder if it's been setup to beamform along the center line only only, no steering, in an annular array manner (concentric rings). This would really simplify the need for electronics, but if there are bad grating lobes (as you will get in an array where the pitch is larger than the wavelength), you can probably charge off to the side anyway as there's uncontrolled energy going in lots of directions. Basically, it doesn't seem the pitch is improved to allow for better steering and any real control - a big issue for safety in my opinion (beaming energy, you kinda want to control that). It also would not be representative of an array capable of steering in arbitrary directions. The phone is attached to an enormous receive case that could be described as a 'brick' - it looks to be about 1.5cm thick which would allow for a number of the Murata transducers at about 1cm thick, along with an electronics board. Now an advantage of such a large box is that it will shield the MEMS gyros in the phone from vibrations which can damage them, but I doubt that's what it's there for - it's simply the smallest that can be made with Murata commercial transducers. It may be that you've heard someone say that'll get better with "Moore's Law for Transducers", implying the transducers get half the size or twice the performance every 18 months. On the face of it is a bit silly as Moore's Law refers to the density of transistors on silicon and has nothing to do with ultrasound, but when you think about it and dig deep it's even sillier when you realise that the performance of ultrasound devices is generally tied through the laws of physics to particular device dimensions. Given those Murata devices were released at least 2 to 3 years ago, shouldn't there have been some major improvements to them by now? But the phone is charging! Errr, well it shows 100% charge, but not that it's charging, and as before no idea of voltage, current etc that we really need to know the charge rate, nor of the overall efficiency of the system. Also, from memory, at >80% charge level the iPhone still shows charging even when less than 250mW are received. So what do we learn from this picture? Not much other than there's a rearrangement of the previous demonstration, it's still apparently off the shelf parts, the receiver case is enormous, and there's no-one experienced in charge of publicity at the company to put out good pictures. As before, there can still be power received, even in the low 10's to 100's of mW, but as engineers and physicists have been saying all along, it's not transmitting power via ultrasound that's in question, it's can you do it at a useful amount, safely, in a practical way, at an acceptable efficiency, with hardware at a reasonable price. This still answers none of those. As noted above, this looks like demo hardware, not even prototype, and still hasn't been shown working or efficiencies given. Can it work in a practical situation like an office or a coffee shop, or under standard use cases? What's the efficiency? Can it steer? How does it know where the phone is and track it? Most importantly, is it proven safe? Is it even legal at the dB level in most countries? What's really interesting though is that uBeam have not yet announced a new funding round. It's near 4 months since the Upfront demonstration, enough time to have completed a funding round with such slam-dunk technology. I'm saying 'no funding (yet)' as there are no new job ads, no publicity, and if one of the 'big guys' who a company will already have had come through to price the round were interested, they would not allow pictures of the tech to get out, especially if it's an Apple or a Google. Four or five months into fundraising things are starting to get stale, everyone knows that the first guys you spoke to haven't come up with terms (or acceptable terms), and that holding out will just get the company more eager to deal. Even with reducing burn rate by shedding senior staff and closing offices, runway only buys you so much in this type of situation. It's getting close to summer as well, and VC's are notorious for disappearing for July and August. I have been expecting it announced soon, since there's no shortage of dumb money to go around these days, as when a 'low toxin butter-coffee' company can raise over $19 million, it seems anything will get funded. Perhaps they're holding out for the best valuation and getting that $100m round on an Energous-beating $400m valuation? Who knows? And, from the public reaction to this picture, who cares? uBeam is the comedy gold that keeps on giving. I just noted the tweet author's name is "Meredith", sharing the antagonist's name in the movie Disclosure (Michael Crichton). In the story, she tries to play some tech "pay no attention to what's behind the curtain" tricks. Sometimes, coincidences make you smile a little. Can't believe they're still "at it", but as you say, apparently almost anything can get funded.